SAS Data Analytic Development is the developer’s compendium for writing better-performing software and the manager’s guide to building comprehensive software performance requirements. The text introduces and parallels the International Organization for Standardization (ISO) software product quality model, demonstrating 15 performance requirements that represent dimensions of software quality, including: reliability, recoverability, robustness, execution efficiency (i.e., speed), efficiency, scalability, portability, security, automation, maintainability, modularity, readability, testability, stability, and reusability. The text is intended to be read cover-to-cover or used as a reference tool to instruct, inspire, deliver, and evaluate software quality. A common fault in many software development environments is a focus on functional requirements—the what and how—to the detriment of performance requirements, which specify instead how well software should function (assessed through software execution) or how easily software should be maintained (assessed through code inspection). Without the definition and communication of performance requirements, developers risk either building software that lacks intended quality or wasting time delivering software that exceeds performance objectives—thus, either underperforming or gold-plating, both of which are undesirable. Managers, customers, and other decision makers should also understand the dimensions of software quality both to define performance requirements at project outset as well as to evaluate whether those objectives were met at software completion. As data analytic software, SAS transforms data into information and ultimately knowledge and data-driven decisions. 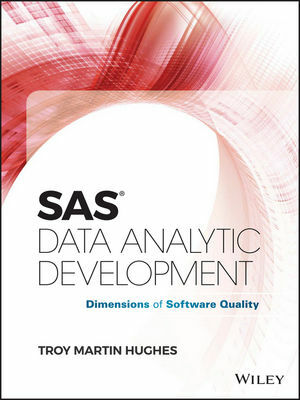 Not surprisingly, data quality is a central focus and theme of SAS literature; however, code quality is far less commonly described and too often references only the speed or efficiency with which software should execute, omitting other critical dimensions of software quality. SAS® software project definitions and technical requirements often fall victim to this paradox, in which rigorous quality requirements exist for data and data products yet not for the software that undergirds them. By demonstrating the cost and benefits of software quality inclusion and the risk of software quality exclusion, stakeholders learn to value, prioritize, implement, and evaluate dimensions of software quality within risk management and project management frameworks of the software development life cycle (SDLC). Thus, SAS Data Analytic Development recalibrates business value, placing code quality on par with data quality, and performance requirements on par with functional requirements. TROY MARTIN HUGHES has been a SAS practitioner for more than 15 years, has managed SAS projects in support of federal, state, and local government initiatives, and is a SAS Certified Advanced Programmer, SAS Certified Base Programmer, SAS Certified Clinical Trials Programmer, and SAS Professional V8. He has an MBA in information systems management and additional credentials, including: PMP, PMI-ACP, PMI-PBA, PMI-RMP, CISSP, CSSLP, CSM, CSD, CSPO, CSP, and ITIL v3 Foundation. He has been a frequent presenter and invited speaker at SAS user conferences, including SAS Global Forum, WUSS, MWSUG, SCSUG, SESUG, and PharmaSUG. Troy is a U.S. Navy veteran with two tours of duty in Afghanistan, and in his spare time, a volunteer firefighter and EMT.